The founder of the Order of Lepanto is available to speak for keynotes, retreats and conferences. You may select one of the programs listed below, or request a program tailored for the needs and interests of your group by contacting us. 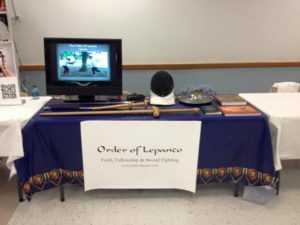 Deepening your faith through martial arts is a hard-hitting 45 minute to 1 hour talk about Catholicism, faith, and martial arts (with live sword demonstrations) that is geared specifically for men’s conferences. The talk is based on our article Deepening your faith through martial arts, but takes time to move more deeply into the concepts presented in writing. 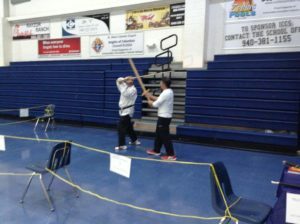 In addition to talks, we offer demonstrations of European martial arts and small group instruction on sword basics. We can customize our demonstrations to fit a particular audience, location, or time frame if needed. If you are interested in booking us for a men’s conference, please fill out our Contact Form. Cost: Exact speaking fees and travel will depend on your needs and location. Please fill out our Contact Form to get a quote.